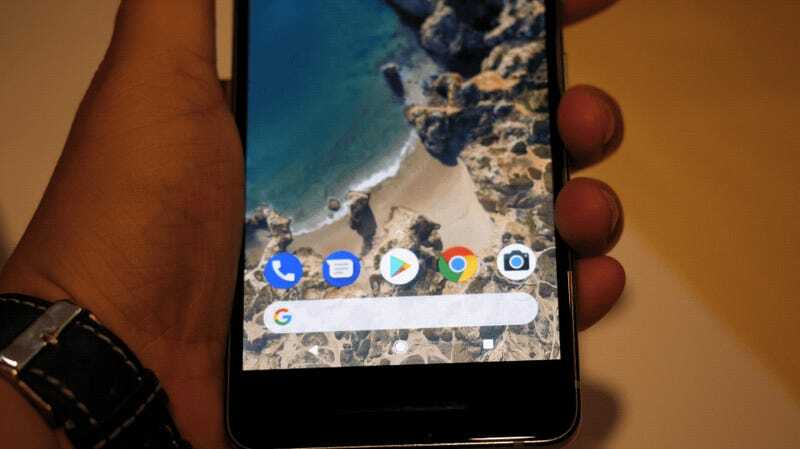 The Google Pixel 2 might not have as vibrant a blue color scheme, but this is a different phone from last year’s model, with a sharper design (that colorful camera button) and some new features that could inspire hope in Google fans who were less than stoked after last year’s outing. The Google Pixel was not an outstanding and world changing phone, despite how much fans (and Google) wanted it to be. The Pixel 2, which was announced earlier today, is going to have to do a lot to win over consumers and surpass the reportedly poor sales of the original (while Google carefully dodged stating real sales numbers at its event today, some observers have estimated as few as 1 million Pixels sold). There are some big improvements to the device that could help it win wallets, but, at least in my experience trying the device for a little while this afternoon, Google’s at risk of once again falling short of expectations. First up, what is different and truly great. The Pixel 2 is water resistant. That will likely harm repairability, but it also means you can stick it in your bra for a run in the rain and not have to buy a new phone when you finish. Even better is the camera’s Portrait mode. 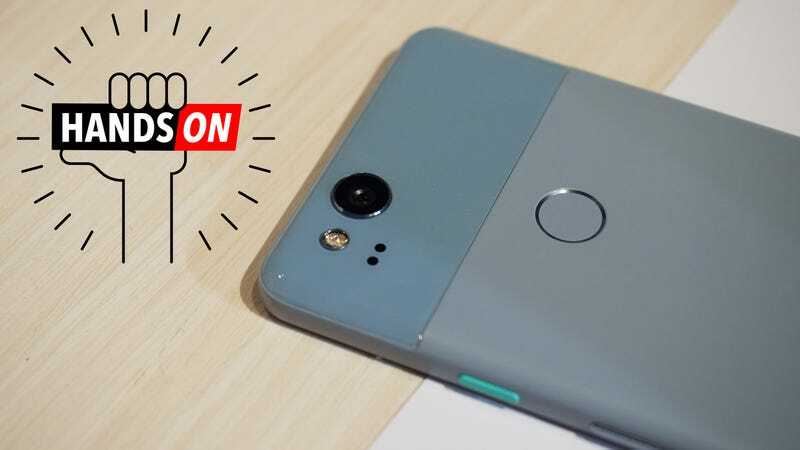 Unlike the iPhone Portrait mode, which only works with the larger dual camera iPhones, Google’s version works on both the Pixel 2 and the larger Pixel 2 XL. That’s a pretty nice portrait! Sadly that is a Google rep—all my attempted selfies failed to Portrait. When it actually worked in my trials, the mode produced some of the best looking portraits I’ve seen on a phone. Locks of hair, which can frequently be blurred into the background on other phones with portrait mode, are sharp and easy to make out. The mode is like other phone camera modes, and is accessed via a drop down menu in the camera app. You should be able to turn on portrait mode, shoot a picture and marvel at your photography skills. Unfortunately, the thing didn’t always work when I wanted it to. On several occasions, I snapped selfies and shots of random journalists, only to find that the camera wasn’t doing its portrait magic. Regardless of whether I was using the selfie camera or the rear camera (it works with both), I couldn’t get it to go—though a Google rep standing next to me managed a few shots with better results. The inconsistency of the feature was a major bummer. It’s worth noting that this was a demo phone, and things could improve drastically by the time the device launches at the end of the month. One thing that worked perfectly, once I scaled the learning curve, was the squeeze function, borrowed from the HTC U11. Squeeze the Pixel 2, and Google Assistant pops up. It’s a neat feature, but definitely requires a little practice as you need to hold it a specific way. Squeeze too high, and you’ll get no response at all. If Google wants the Pixel 2 to win, it will need to deliver the wow factor of the squeeze, and none of the unreliability of the camera modes. At the event today, Google made it clear that software and AI, not hardware, were how it hoped to stand apart from its competitors. Last year, it touted its super smart assistant, which didn’t live up to the overblown marketing. This year, the company is back with more of the same, and yes, the Google Assistant might be the smartest out there—it can make intuitive leaps while Amazon’s Alexa and Apple’s Siri are still stuck in a prison of if/then causality. A phone that knows the music playing in the bar before I do is an impressive damn machine. But without the software polish of its competitors, the Pixel 2 will struggle to compete against Apple, which has polished software and hardware, and Samsung, which after years of TouchWiz hiccups has started producing nearly flawless Android phones that get legions excited. Really sad there isn’t a coral option. The two-tone XL looks gorgeous. The display is always on, but because it’s OLED battery life shouldn’t be affected.